Seven women are sitting around a table with cake and flowers (daffodils) for a celebration of the 37th anniversary of the Brooklin Women's Institute at Brooklin United Church. This photo was printed on page 5 of the February 27, 1947 issue of "The Daily Times Gazette" and shows the head table. Members in this photo are wearing clothing that was "in vogue" when the Brooklin branch of the Institute was first formed in 1910. From left to right: Miss A. Olver, Mrs. F. Holliday, Mrs. H. McCool (president), Mrs. A.C. Elliott, Mrs. MacNeely, Mrs. N.J. White and Miss A. Vipond. There is an article "Brooklin Women's Institute Celebrate 37th Anniversary" on page 5 of this issue of "The Daily Times Gazette" and an article entitled "Pages of History Turned Back at Women's Institute Jubilee" on page 6. 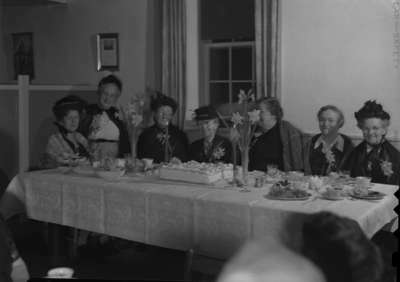 Brooklin Womens' Institute 37th Anniversary Celebration, 1947, Marjorie Ruddy. Whitby Archives A2013_040_1275.